Earlier today I attended a poetry reading at an independent bookstore a few miles south of where I live. A former instructor of mine, Florence Nash, along with two other female poets read from their chapbooks. Throughout the readings, I drifted on the words, phrases, rhythms, twists, poignancy, humor and surprise endings. I took Ms. Nash’s poetry class after I had heard a speaker at a conference say he assigns students enrolled in his Creative Writing course to write poetry in order to develop creativity, an ear for cadence of a phrase and ability to make every word count. I loved the poetry class. But I found I struggled with writing poetry even more than I struggled with writing prose. Besides, the amount of time I devoted to writing poetry eclipsed the time I spent on my creative non-fiction projects. I had to make a choice and chose to concentrate on finishing my non-fiction book. I suppose I’m a one-skill person. However, reading poetry out loud helps me appreciate the beauty of language and hopefully makes me a better writer. I did complete one poem that I liked, a pantoum, (see below) in Ms. Nash’s class. I sent it off to a contest. It was rejected. Not much difference with the results of my prose submissions. Oh well. Soothing the cold rainy day. 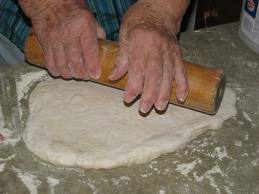 Her gnarled hands crusted with flour. And gives me a garlicky kiss. It’s the warmth of her love that I miss. I think this is wonderful . It conjures up a real cooking grandma. How lucky you are to have had her and to be able to capture her in a poem — I am sure you could do more. I know poets spend inordinate amounts of time polishing words…maybe you will find the time, some time! As with writing prose, sometimes you never know where a poem is going. I do miss her and her wonderful cooking. I love the images, the sounds, the assonance and alliteration. A good reminder to use words sparingly.